A female black widow spider. The Florida Everglades is an area that is certainly not without its creepy crawlies, and one can never talk about the most fascinating, yet terrifying, creatures of the Everglades without mentioning some of the spiders that can be found there. Fortunately, of the hundreds, if not thousands, of species of spiders that can be found in the Everglades, only a very small number of them are venomous to humans. The most commonly found venomous spider that can be found in the Everglades is the black widow, a species that is found throughout the southeastern United States and as far north as Ohio. They are quite distinctive in appearance, with females having large, black bodies with a red hourglass design in the center. There are other types of widow spiders, most notably the brown widow and the red widow, both of which can be found in southern Florida in addition to their more famous cousin. Both of these spiders are also considered poisonous, though less so than the black widow. All species in the widow family get their names from a unique behavior performed by the females – after mating, they will occasionally kill the males. This may explain why female black widow spiders have a lifespan of up to three years, while males are lucky to live three days. This may also explain their great variation in size and appearance. Female black widows are shiny and black, reaching lengths of around 1.5 inches, and containing the famous red hourglass pattern – although in many individuals it will be more orange in color and not resemble an hourglass at all. Males, on the other hand, rarely exceed 0.25 inches in length and are more purple in color, lacking any red or orange pattern completely. While the practice of black widow mating is creepy in itself, the practice of cannibalism within the species does not stop there. While a female black widow can lay more than 3,000 eggs during a single summer breeding season, it is estimated that only around thirty survive to the first molting. Why? Because of lack of shelter or food initially, but most creepily because of their tendency to turn to each other as sources of food during times of scarcity. 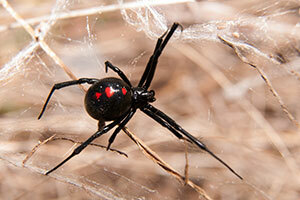 Fortunately, while black widow venom is toxic to humans, it is very seldom fatal. It is, however, along with their particularly strong webs, highly effective at catching and subduing their intended prey, which typically consists of small insects, centipedes, millipedes, and other spiders. Once their prey has become entangled in their webs, webs which are strong enough to even capture small rodents at times, the widow spider will bite its victim and inject it with its venom. Once the prey has succumbed to the venom, which usually takes about ten minutes, the widow will carry it back to its nest to feed on. Spiders are definitely one of the most feared creatures in the animal kingdom, and black widows and their close cousins are absolutely among the creepiest of the bunch. It’s likely that you’d prefer not to see any on an Everglades swamp tour with your family, and chances are good that you won’t – these species are incredibly shy and non-aggressive, despite the bad rap that they’ve been given. Everglades airboat tours are, however, a great chance to see much of Florida’s wildlife up close, and are not to be missed when visiting Florida this season. Previous story How Do Hurricanes Affect Florida Wildlife?